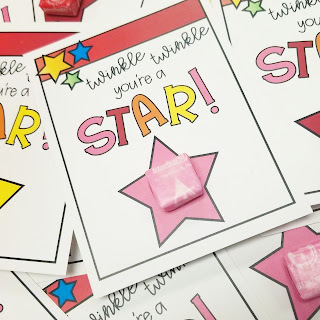 I love giving my students nonfood Valentines, since they always end up with WAY too much sugar and treats. 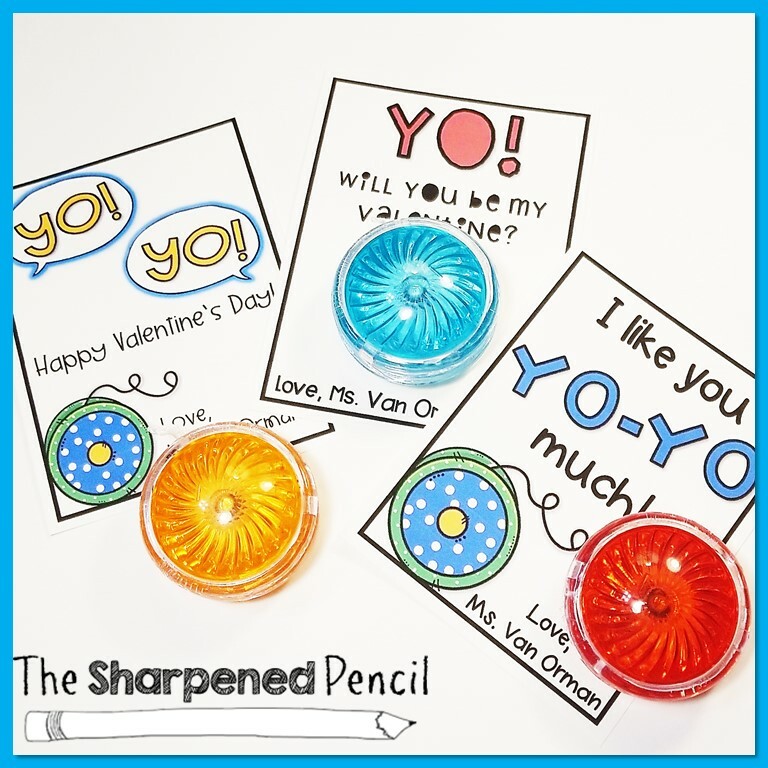 Since my class always seem to be obsessed with yo-yos, I picked up a few packs from the Target Party Section for their Valentine’s gift! I printed these adorable gift tags and they were a hit! 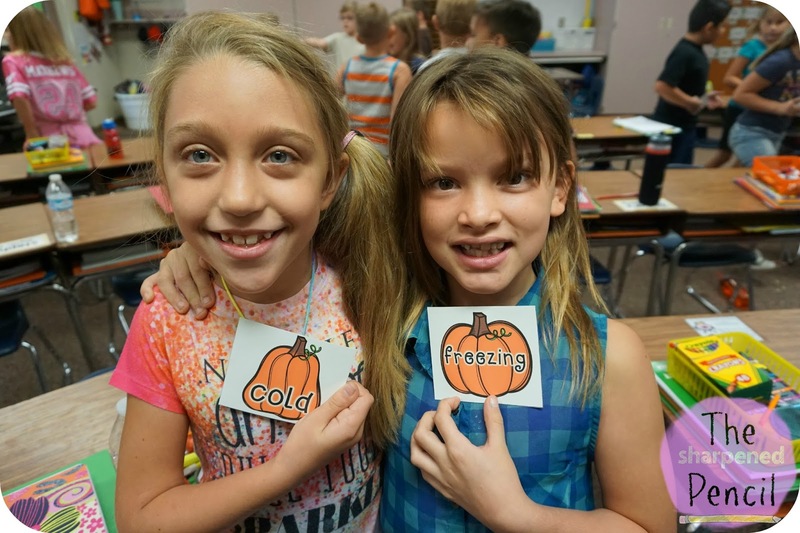 Click here to grab these free tags. 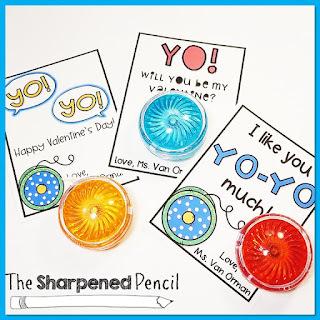 Click here to see more Valentine's Day fun for your classroom! In my school district Kindergarten Registration (or Kindergarten Round Up) starts at the end of January. Our school holds a special evening event to give parents a chance to fill out all the required paperwork, meet the teachers, and tour the classrooms. Our Kindergarten Registration Night was a huge success this year as we had more parents and children attend than ever before. 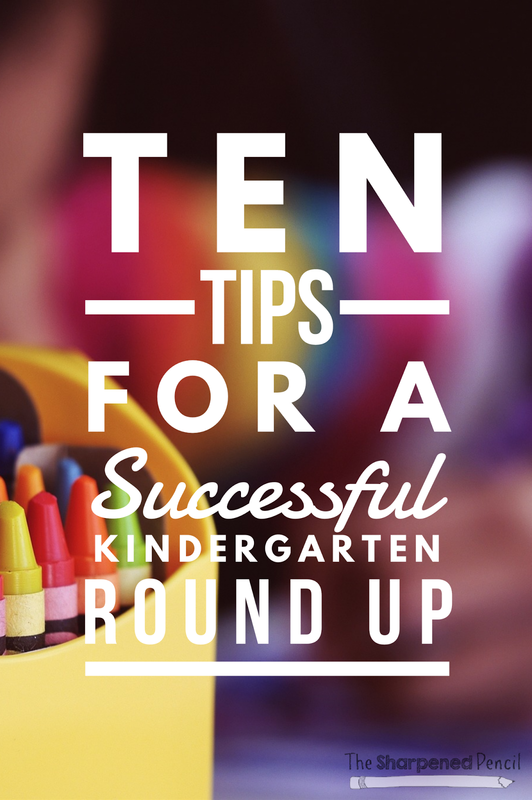 I would like to share with you ten ways to help run a successful Kindergarten Registration event. When we asked parents why they had not attended previous Kindergarten Registrations, the number one reason was they simply did not know about it. Advertising is key to a great turnout. We made a special postcard to mail out to every family in our school. As you well know, notes teachers send with students don’t always make it home. Mailing the postcards made sure every family was aware. We also distributed these postcards to local daycares and preschools, in an attempt to invite families who were not already enrolled at our school. In addition to the postcards, we posted the information on our marquee, in the school newsletter, and on a huge banner in the parent parking lot. 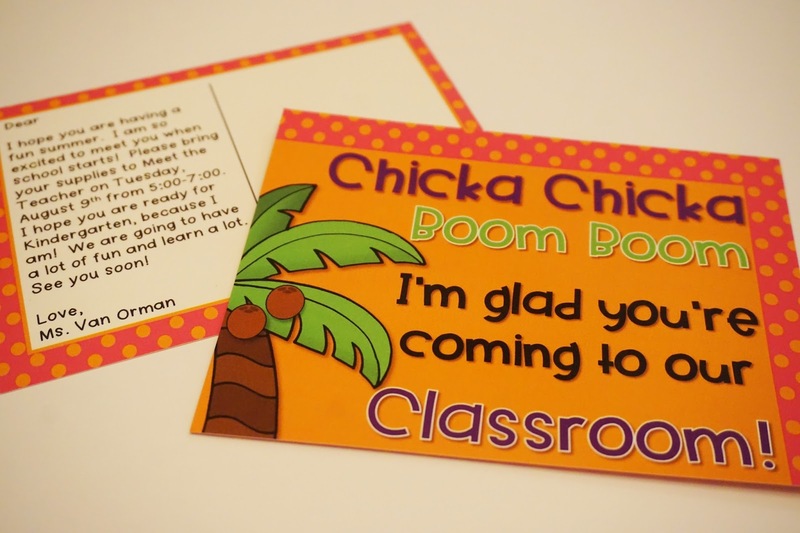 Examples of the post cards we made. 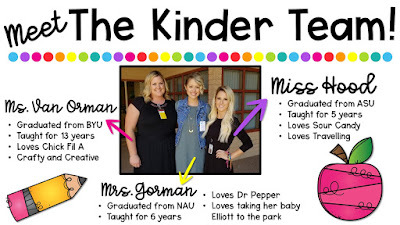 Starting Kindergarten is a really big deal! For some families it’s their first child leaving the home and going to school. For others, it’s their baby that they are sending off. Either way, it is a very exciting event and simple decorations will help make it more fun and help everyone feel more welcome. We put up balloons and welcome signs at the office and in the classrooms. The most exciting part of Kindergarten Registration is giving the children and families a chance to meet the teachers and see their classrooms. All three of the kindergarten teachers at our school were at the event, sporting matching Kinder DreamTeam tees from Lipstick and Littles. While matching shirts are definitely not necessary, it made it a lot easier to find one of the teachers in the crowd of people. 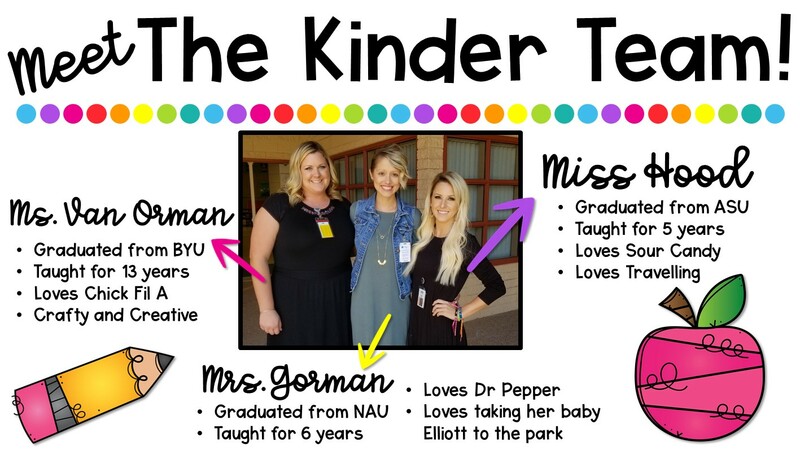 We also made a simple “Meet the Kinder Team” slide to project in our classrooms, so the families could get to know us a little bit. If you don’t have a projector or the ability to create a digital presentation, a simple poster board would do just fine! Example of our Meet the Teacher slide. 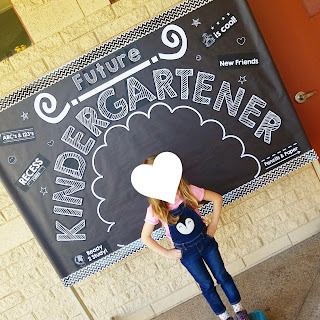 At the entrance of the classrooms, we had a big bulletin board set up outside for families to take pictures of their future kindergartener. It was a huge hit! This bulletin board set came from Simply Kinder and was so easy to put together. As the new student and family came into the rooms, we greeted the child first and handed them a treat, welcoming them to our school. This helped us make a personal and positive connection with each student before they even began the tour. 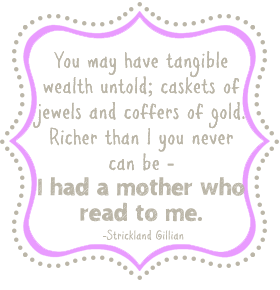 Grab this free printable in my Teachers Pay Teachers Store. Parents were given a folder with basic kindergarten information inside. Keep it simple, the whole experience can be overwhelming. More information is given at Meet the Teacher and Curriculum Night at the beginning of the school year. The folders included a sample schedule of a day in kindergarten, an alphabet chart, a page showing proper formation of letters, a list of skills children should be able to do before starting school, and a note with activities parents can do with their child to help prepare them for kindergarten. Our district also provided parents with an informational booklet, scissors, glue, crayons, and additional ways to help at home. Playing music in the background is another simple way to create a positive environment where children feel more comfortable. We had a CD of Toddler Tunes playing in the background. Not only does music create a more positive atmosphere, but it also helps avoid any awkward silence. Display a variety of student work displayed around the room. Parents and children loved seeing a sampling of activities they would be doing when they came to kindergarten. We also had a few student scrapbooks on display. The children needed something to keep them occupied while parents were completing the required registration paperwork. We set out coloring pages and a few manipulatives (pattern blocks, linking cubes, legos) for them to play with. Children are curious and will explore, so be sure to put away anything you don’t want them to play with. Do you do a Kindergarten Round Up? What have you found to be successful? One of the prettiest sights at Christmastime is the decorated tree. In this activity, your child will construct his own Christmas tree while practicing cutting out rectangles, overlapping and measuring to create this adorable modern design. It's also a great way to begin learning design and repetitive patterns. Have your child place the construction paper, one sheet of each color, in a horizontal, or landscape position. Then, set one sheet of white paper to the side in a vertical position. Ask him to cut strips of paper from the bottom to the top of each sheet of paper. The strips should be about 1" wide. Have him cut one small square for the base of the tree, about 2.5" x 2.5", and glue it to the bottom of the white paper. Encourage him to draw and cut out a star for the top of his tree. Set it aside for now. 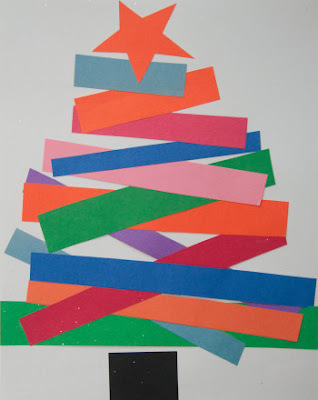 Ask him to lay out the strips of colored paper on the white paper, overlapping them to create the basic shape of the Christmas tree. Don't worry if the paper extends over the edges of the tree, it'll be cut down later. Encourage him to play with changing up the colors and various ways of slanting the rectangles, overlapping them to create his tree. When the rectangles of paper are in their final positions, have him use the ruler to lightly draw a straight line (not a diagonal) where the paper should be cut. Have him carefully lift up each edge of paper and cut it along his drawn line, then glue it in place. Continue cutting and gluing until all rectangles are adhered in position from top to bottom, small to large. Complete the Christmas tree by having him glue the star at the very top of the tree. My kindergartners had a blast making these Christmas trees this year! To adapt it, I pre-cut all the strips of paper and they arranged them in order from shortest to longest. It was a fantastic way to end our measurement unit. You can check out my Merry Measurement Unit here. 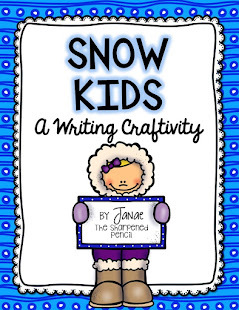 This engaging and educational Christmas craftivity comes from Education.com. First Day Fun with Playdough! 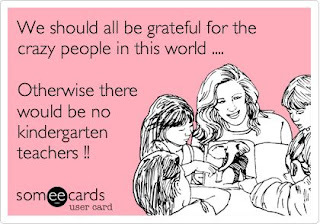 We all know the first day of school can be hectic for most teachers. At many of the schools I've worked at, we've had a “Meet the Teacher/Bring Your Supplies Day” before school officially begins. However, there were a couple years when we didn't have those days and students brought all their supplies and met their teacher on the first day of school! When the first day comes, with all the supplies to put away, it does get very hectic! 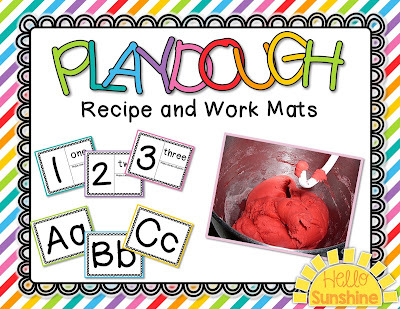 Instead of expecting children to settle down with a worksheet, I placed a Ziploc bag filled with play dough and some work mats on each desk. 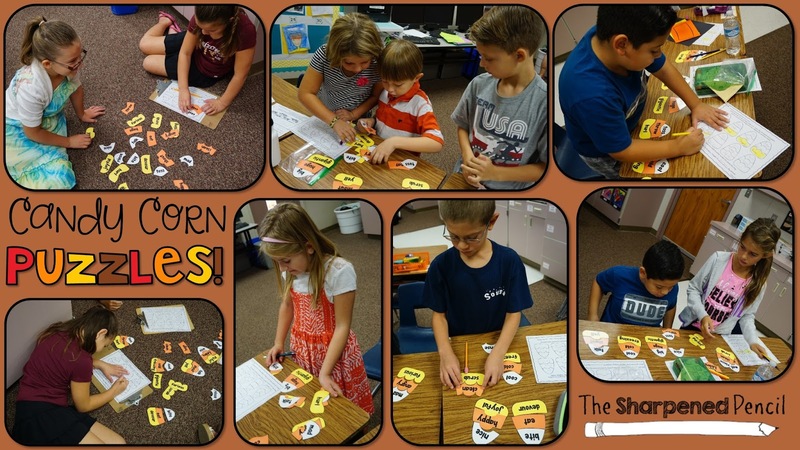 This is a highly engaging activity that requires no teacher guidance - allowing time to collect and assemble supplies. In addition, it also provides the children with a fun activity to calm their back to school jitters! When I used this activity in my classroom, I had each child practice making numbers and their name with the play dough. Then I had them make something to represent their favorite summer activity. This became one of our first “getting to know you” activities. Each child shared about what they made. -use the dough to mold elements from a favorite book or story, etc. 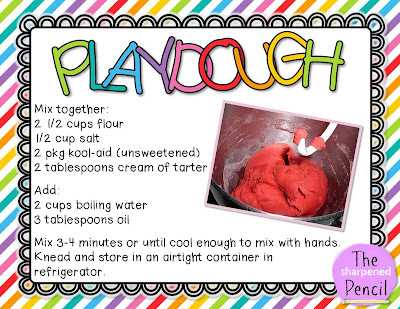 What ideas do you have for incorporating play dough fun with the first day of school? Call me crazy, because I'm teaching Kindergarten this year! I'm super excited for this change, but scared out of my mind! 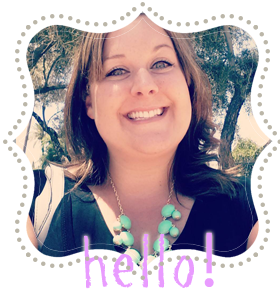 ;) With only two weeks until I meet my littles, I've been busy prepping for the new year! First thing on my list was my Welcome to School Postcards. 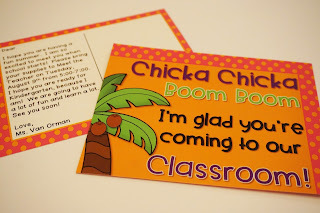 I have loved sending postcards to my future students before school starts each year. It's a wonderful way to start the year off on a positive note and to start building up that rapport. My students talk about their postcards all year long! It's so special to them! While you can certainly print these postcards on your own, I sent mine to Vistaprint. The quality and price are excellent. They always seem to have a coupon code for an even better discount. If you would like to use this postcard to welcome your students back to school, click on the images above. They fit perfectly on the standard postcard size. Today I'm sharing one of my favorite classroom games over on Cassandra's blog. Check it out! Buy some foam pieces and glue magnets on the back. I bought my set from Hobby Lobby. Write a variety of numbers on the back of each piece. 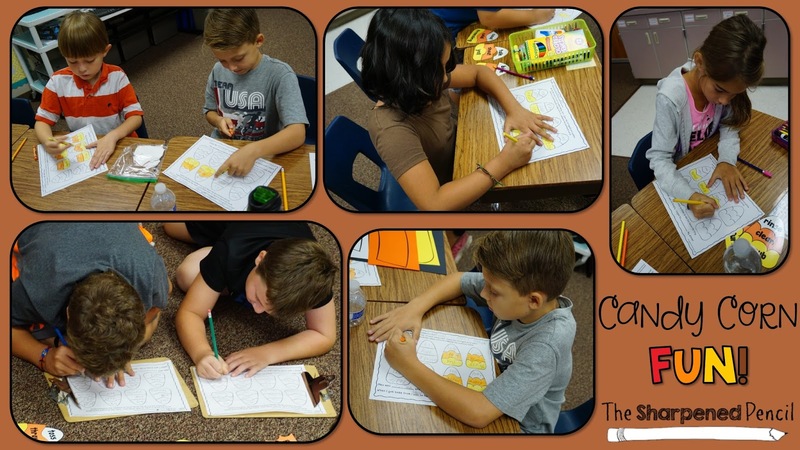 Use whatever numbers work best for your class to do mental math with. When I was in 2nd Grade, we used 2-digit numbers, mostly multiples of 10, with a few ending in 5. This year, I have mostly 2-digit and a few 3-digit, ending with a 0 or 5. My co-worker in 5th grade used more 3-digit numbers. Whatever works for you! Write an X and ZONK on a couple of them. I like to play this as a review before a math assessment, but it can be used for any subject! 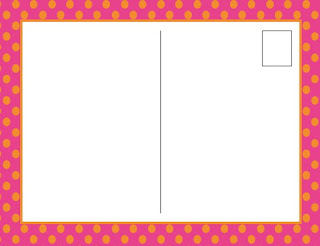 Prepare questions for your students to answer using worksheets, task cards, and/or whiteboards. I play boys VS girls, and keep score on the board. Put all the foam pieces on the board. Display your first question. EVERY student answers it. I set a timer to ensure we get through the questions. When the time is up, choose a boy or girl to answer. If they answer correctly, they come to the board to choose up to three foam pieces, and record the score. If they answer incorrectly, the other team gets a chance to steal the points. If the second team answers incorrectly, I explain the answer and move on to the next question. It really is our favorite game! 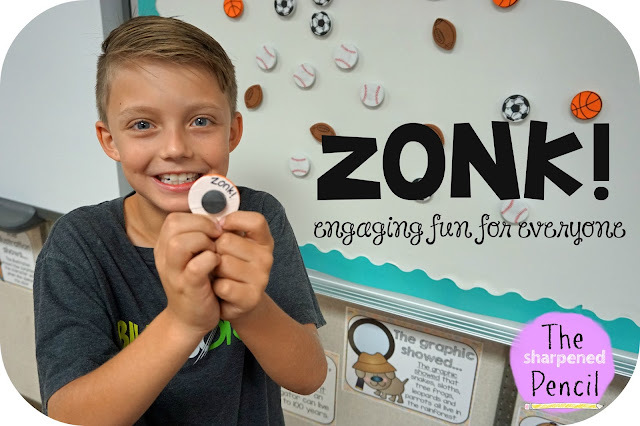 So easy, engaging, and exciting! We've had fun this week working on shades of meaning! 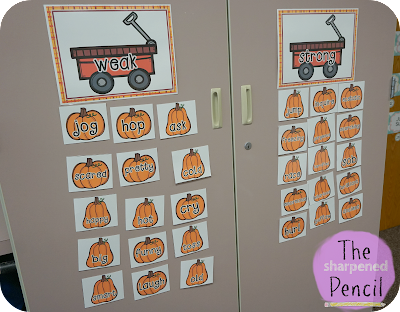 This can be a difficult concept for many 2nd and 3rd graders, but I've created some fun, fall-themed activities to support distinguishing shades of meaning among related verbs and adjectives. 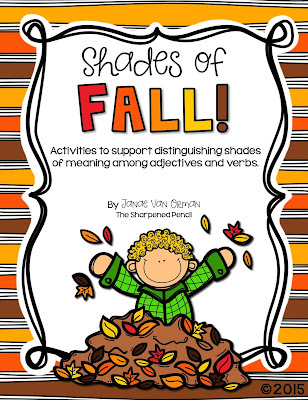 You can find my Shades of Fall packet here. Once everyone found their partner, we sorted the words into two groups - weak and strong. Finally, students completed an independent activity page. This boy thought he was being so funny with his sentence... How could I be mad when he did such an excellent job??? HA! 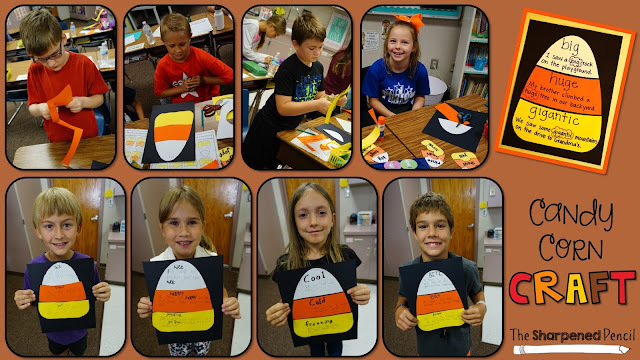 On Friday, we did the candy corn activities from my packet. We started by assembling candy corn puzzles. 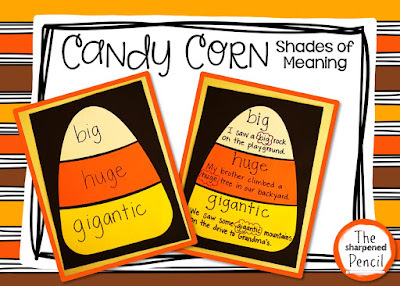 Each candy corn was made up of three words that have similar meanings. I cut them apart ahead of time, and then the groups had to assemble each puzzle. When they finished assembling the puzzles, they recorded their answers on the recording sheet. 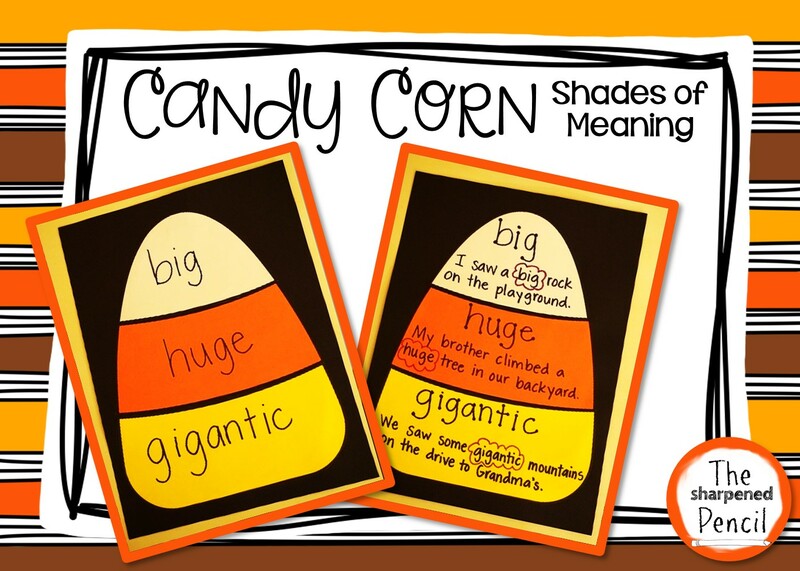 Finally, they chose one of the candy corn puzzles to create their own candy corn for. 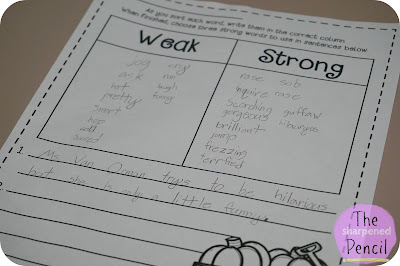 They had to write a sentence for each word, showing the differences in their meanings. On Monday, I'll hang the completed candy corn craftivities up for an educational and festive display! You can find these activities and more in my Shades of Fall packet. Since making the move from 2nd Grade up to 3rd Grade this year, I've been fortunate enough to meet some incredible 3rd Grade Teachers. They have been so patient and helpful as I ask a million questions on a regular basis! I am thrilled to be part of a wonderful fall blog hop with some of these amazing 3rd Grade Teachers! I can't wait to hop along and learn more from these fabulous teachers. I'm a summer girl by heart, but I absolutely LOVE fall in Arizona. It's about 80 degrees and absolutely heavenly! I do miss the beautiful colors of fall and the sound of the crunchy leaves, so I still like to pretend it's fall with plenty of fall themed activities. This year, I decided to combine my love for fall and my love for shades of meaning and create a brand new product! 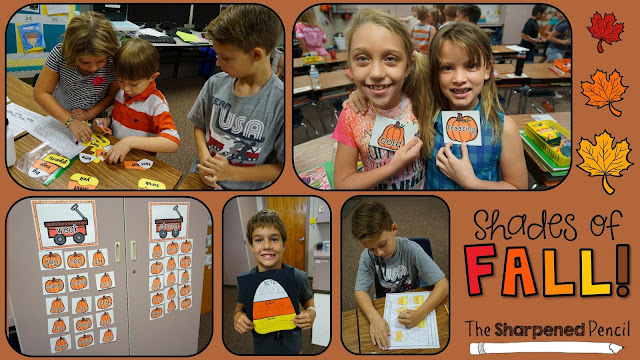 This packet is packed FULL of fall-themed activities to help teach this 2nd and 3rd Grade standard. 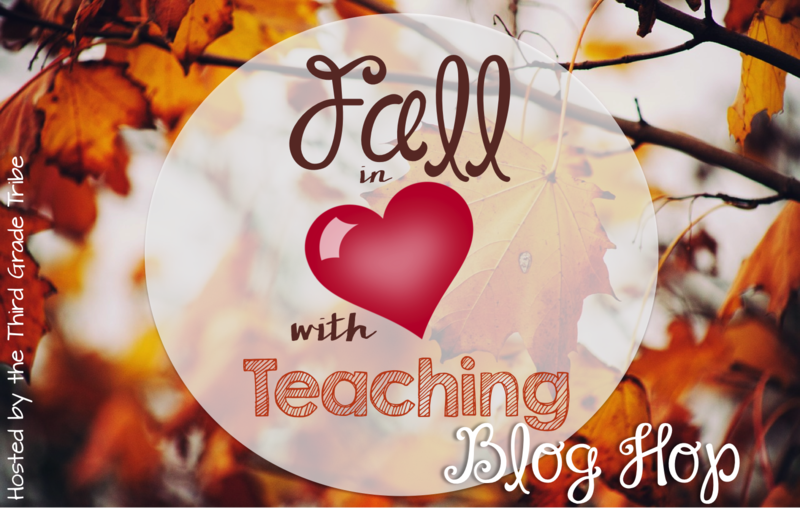 I've come up with centers, worksheets, craftivities, bulletin board displays, and assessments for all the fun fall themes! I've included apples, leaves, pumpkins, and candy corn. Tell me this isn't the cutest candy corn you've ever seen??? I just love this little craftivity! 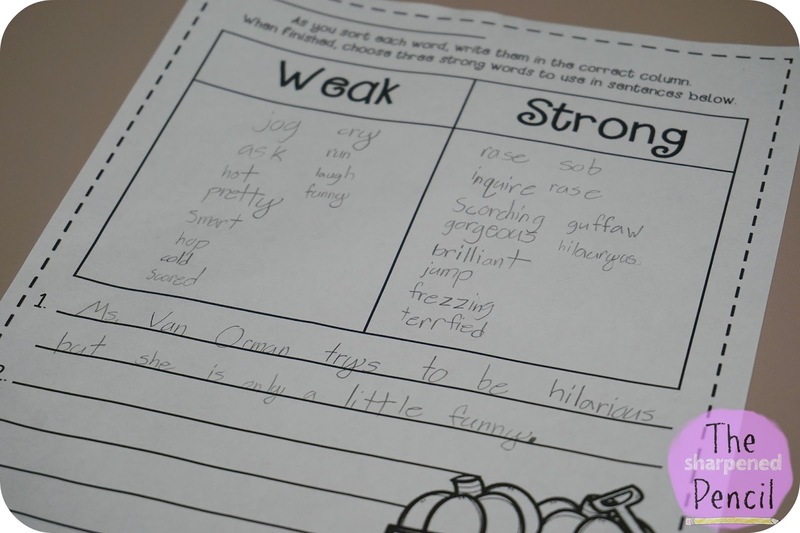 This is just one example of all the fun you'll find in my Shades of Fall packet. I'm giving away this 80 page packet to one lucky reader! 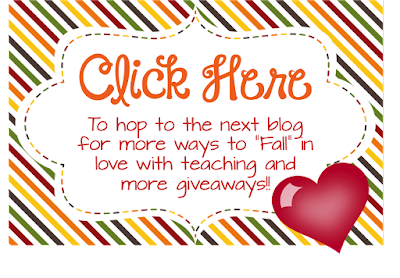 Now hop on over to Pam at Hedgehog Reader and see what Fall fun she has in store for you! 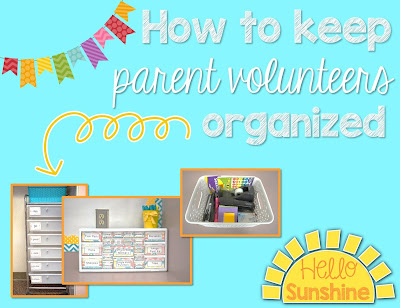 Today I posted over on Hello Sunshine about how I keep parent volunteers organized in my classroom! Parent Volunteers can literally save your classroom. I have had years with no parent volunteers, and years with more than I could possibly find a use for. It really just helps the classroom stay organized and run smoothly if you know how to utilize them properly. Last year I had so many that I just didn't even know what to do, so I came up with these systems to help me keep me organized. Click on the picture below to check it out! First Day Fun with Play Dough! 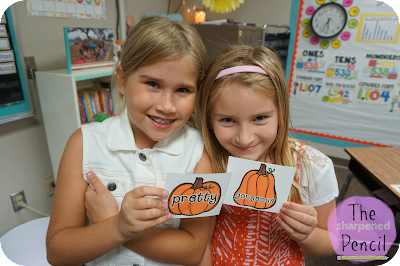 Today I posted over on Hello Sunshine about one of my favorite first day activities! This is a highly engaging activity that requires no teacher guidance - allowing time to collect and assemble supplies. Click on the picture below to check it out!